PharmaLink is dedicated to becoming the healthcare supply chain’s strongest link by providing leading pharmaceutical returns and disposal solutions to customers nationwide. Largo, FL. 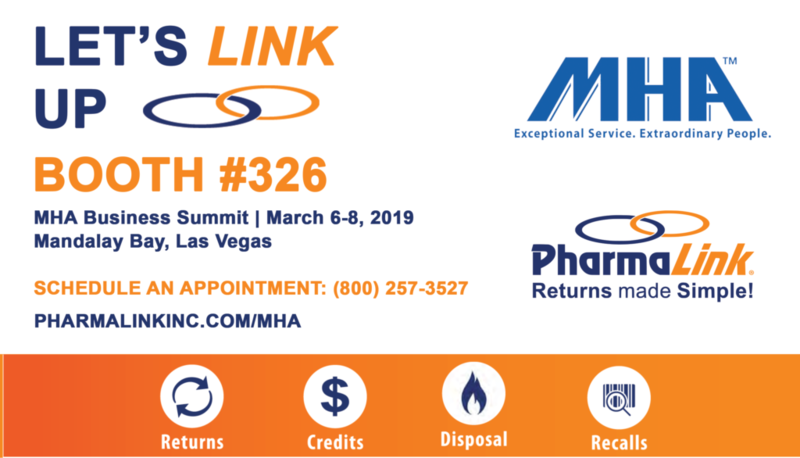 – PharmaLink will be exhibiting at booth # 326 for the sixteenth annual MHA Business Summit taking place March 6-8, 2019 at the Mandalay Bay in Las Vegas. The MHA Business Summit will bring together 1,500 long-term care, home infusion and specialty pharmacy professionals, as well as executives from leading healthcare organizations for a two-day conference. Attendees will engage in discussions about “federal and state legislation, general and health care economic trends, business issues and other market forces effecting the pharma space” during the duration of the conference. PharmaLink will have the opportunity to meet with attendees during the Networking and Exhibition Breakout sessions on Thursday and Friday.